Welcome to the Home of the Best Bird Food Ever! Your bird’s good health is our concern. 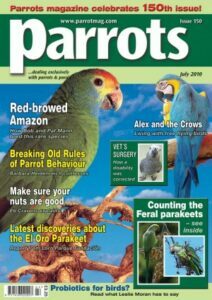 Learn why balanced nutrition is the foundation of holistic health care for parrots. Malnutrition is a physical state of unbalanced nutrition, this is caused by a lack of complete protein or a lack, or imbalance, in any of the hundreds of nutrients a bird must eat everyday. The only way to End Avian Malnutrition for your birds is to feed them all of the hundreds of nutrients they must eat everyday. Why Feed Your Bird’s Organic? Feeding your parrots organic foods will improve their health. Learn the facts. USDA Certified Organic – What Does this Mean? Certified Organic means we support the health of you and your birds, the environment and we use sustainable practices in running our business. Published by Physicians for Social Responsibility (PSR-LA) & Californians for Pesticide Reform (CPR) in 2000, this landmark 60 page report is a must read.